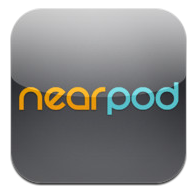 Our principal introduced the Nearpod app to our staff in August at one of our first in-service days. I loved the way the app made me feel like she was talking directly to me – like I had some sort of front-row seat to what she was saying. Nevermind the fact that every other teacher was watching the exact same presentation on their respective iPads… this felt personal anyway. I’d venture to say that’s the way my own students felt when I started using Nearpod in my classroom last week. 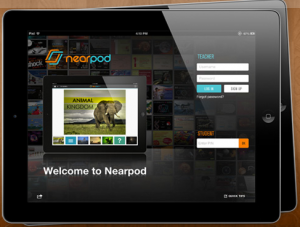 Nearpod is a presentation power-trip! A teacher can convert a presentation like PowerPoint or Keynote to a PDF, upload it to Nearpod, then “show” the presentation, one slide at a time, to a class of students. Each student’s iPad matches the teacher’s iPad throughout the experience, and only the teacher can control transitions from one slide to the next. Currently, I am using the free version of Nearpod, which limits the size of presentations, but I look forward to using more of the interactive features a Nearpod upgrade offers, such as built-in “quiz” questions along the way… stay tuned! I decided to use Nearpod since I had some topics coming up in both Algebra and Pre-Algebra where a presentation of some sort seemed to fit. In Algebra, representations of relations using ordered pairs, tables of values, mapping diagrams and graphs were very visual topics – I thought a Nearpod experience would help students make connections, as well as give them the opportunity to take screenshots of all of those goodies during the presentation. For Pre-Algebra, we were exploring arithmetic sequences. Rather than start with a definition, I provided sample number patterns within the Nearpod presentation slides, and simply asked, “What’s next?” making the patterns progressively more challenging. Students were guided to “discover” characteristics of arithmetic sequences, while being presented with key vocabulary. Feedback was very positive! Students liked the way the information was personally presented to them at their seats with their own iPads. I wish the free version of Nearpod allowed for more memory – I had to split one simple presentation into two separate ones because the file was too large, even though it was only a few slides with text and had no interactive slides. Another downside was that Nearpod worked with some class periods flawlessly! Others… I got the spinning wheel of death on my iPad, which meant that none of my students had a chance of moving on if my iPad was “stuck”. We all had to close the app, try logging in with a newly generated PIN, and cross our fingers… sometimes we were able to resume the presentation, and other times we had to lay it to rest, and I resorted back to my screen and projector for the remainder of the presentation. Nearpod? Network? Frustrating, but I see much potential with this tool, I still have a lot to learn about it, and in the end, the students really enjoyed this unique experience that only an iPad could allow to happen! This entry was posted in Algebra 1, Pre-Algebra and tagged Algebra, iPad, nearpod, Pre-Algebra. Bookmark the permalink.